The Keysight 16802A is available to buy refurbished used or rent, usually from our UK stock. Click here to download the Keysight 16802A datasheet. 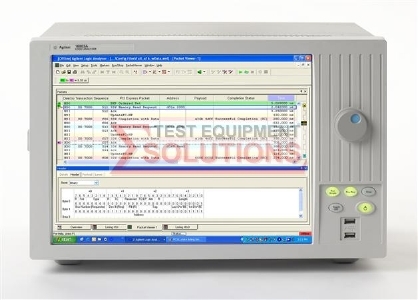 Keysight 16800 Series portable logic analyzers offer the performance, applications, and usability your digital development team needs to quickly debug, validate, and optimize your digital systemat a price that fits your budget. Accurately measure precise timing relationships using 4 GHz (250 ps) timing zoom with 64 K depth. Find anomalies separated in time with memory depths upgradeable to 32 M.
Buy what you need today and upgrade in the future. 16800 Series logic analyzers come with independent upgrades for memory depth and state speed. Sample synchronous buses accurately and confidently using eye finder. Eye finder automatically adjusts threshold and setup and hold to give you the highest confidence in measurements on high-speed buses. Track problems from symptom to root cause across several measurement modes by viewing time-correlated data in waveform/chart, listing, inverse assembly, source code, or compare display. Set up triggers quickly and confidently with intuitive, simple, quick, and advanced triggering. This capability combines new trigger functionality with an intuitive user interface. Access the signals that hold the key to your systems problems with the industrys widest range of probing accessories with capacitive loading down to 0.7 pF. Monitor and correlate multiple buses with split analyzer capability, which provides single and multibus support (timing, state, timing/state or state/ state configurations). We offer the refurbished used Keysight (Agilent) 16802A 68 Channel Portable Logic Analyzer for sale and rental. The Keysight 16802A is fully tested and refurbished in our in-house ISO9001 calibration laboratory. We supply manuals, accessories, full warranty and a free-of-charge Certificate of Conformity. We can also provide the Keysight 16802A with a fresh calibration for a small additional charge. If you have under-utilised test equipment talk to us about trading-in or part-exchanging it towards the Keysight 16802A or other refurbished test equipment.